I find this picture, recently posted to the Contact Quarterly Newsletter, surprisingly moving. The reason, I think, is that it’s like seeing a unicorn. Glass half-full: I never see two people of color doing contact together! Glass half-empty: I never see two people of color doing contact together. It is rare, and beautiful, and mythical. It is something that you never thought you would actually see. I have never before seen a picture of two people of color doing contact improvisation together. Is it possible that this is the first published photo of such? If you aren’t aware already, contact improvisation is overwhelmingly, pervasively white. A handful of East Asians here and there, and very, very rarely, someone with darker skin color. But lots and lots of white people. And no, no one is especially racist (though I’ll say, some insensitive, not-so-thoughtful stuff goes down from time to time), and no one is actively trying to keep people out. But even in extraordinarily racially diverse cities like New York and Los Angeles, contact improvisation is shockingly monochromatic. I was nevertheless a little surprised by my reaction to this picture. I thought to myself, I see non-white people at contact events all of the time. Why is it that two people of color dancing together is such a rare sight to me? Then I realized — I’m the other person of color. I dance with non-white contact dancers all of the time — but it’s rare that there are at least three people of color at a contact jam, and even rarer that two people of color who are not me will happen to find each other at any given jam. The odds of such a thing happening are, one would hope, considerably higher in Goa, India, where the picture and accompanying article come from. India has, you know, around a billion people of color, give or take a few hundred million. And why, exactly, does it move me? It’s not as if there are years of oppression that people of color are overcoming to do contact improvisation. There aren’t, and as far as I know, have never been explicit barriers to entry. 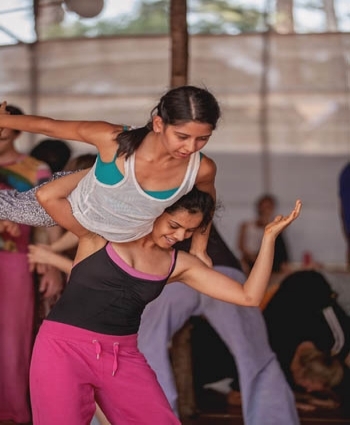 While the contact improvisation community has not always been proactive in its embracing of non-white dancers (read: well-intentioned but awkward, if not complacent), but people who want to dance can, and and are reasonably well-accepted. It’s a much deeper and more complicated issue. It has something to do with Jeremy Lin scoring the winning basket in Toronto in February 2012, or Bill de Blasio getting sworn in with his interracial family. It has something to do with outward markers of racial differences being casually tossed aside, even if we mark the moment by noticing race. It is, in short, the subject of a much longer article. But for now, I am happy to have seen the unicorn. And I look forward to the day when pictures like this are neither rare nor mythical, but everyday and real.